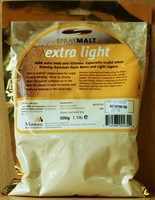 Light dried malt extract for improving the body and flavour of homebrew lager kits. Extra Light Spraymalt is simply spray dried liquid malt extract and is used instead of sugar to add body to single can lager kits or can be used instead of liquid malt extract when brewing lager or pale ales and summer ales using your own recipes. It is best used in lagers or "blonde" beers, often in a 50/50 ratio with sugar or brewing sugar.